Vitamin D is most commonly associated with assisting the maintenance of strong bones and teeth, supporting the functions of the immune system and contributing toward normal muscle functions. Vitamin D3 is the most bioavailable form of this vitamin. Vitamin D also contributes to the normal absorption/utilisation of calcium and phosphorus as well as contributing to normal blood calcium levels. It is needed for normal growth and development of bone in children and has a role in the process of cell division. Those at particular risk of Vitamin D deficiency are children (under 5 years), the elderly (65 years+), pregnant women and those that rarely get outdoors (lack of sunshine). Insufficient vitamin D is now known to be a factor in the aetiology of many disease conditions, where adequate levels of intake are found to be protective. Take 1 tablet per day as a food supplement or as directed by a practitioner. 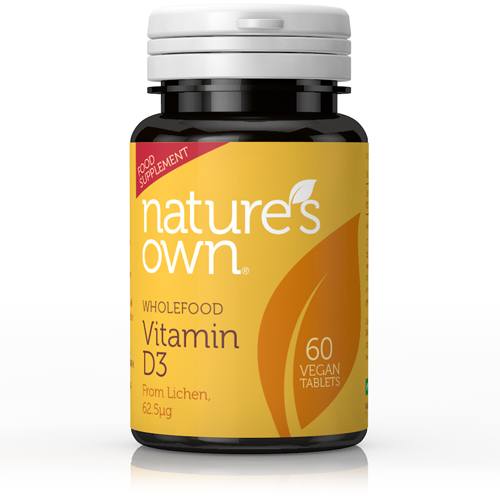 Below are reviews of Natures Own Wholefood Vitamin D3 - 60 Tablets by bodykind customers. If you have tried this product we'd love to hear what you think so please leave a review. These are now my go to Vitamin D after trying various brands over the last few years. Small, easy to swallow tablets and a good dose for an affordable price. Haven't been tested in a while so not sure how increased my Vitamin D levels are but I was put on Vitamin D by my GP after very low energy and mood and I'd say that overall, these have both improved somewhat. Noticed a huge change from a deep depression (SAD) almost immediately. Now balanced out so more difficult to tell if still having positive effect but on the odd day missed there is a little drop in mood. 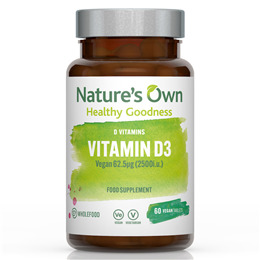 Vitamin D is most commonly associated with assisting the maintenance of strong bones and teeth, supporting the functions of the immune system and contributing toward normal muscle functions. Vitamin D3 is the most bioavailable form of vitamin D.